Apple quietly soft-launched a new iPad in March 2017. It's launched with a new iPad tag line - "Flat Out Fun" - and it's a terrific update to the iPad family of products. By adding more power and features while substantially lowering the price of the iPad to just $349, it's a win win-win for iPad lovers and a great time to update and buy a new iPad for students schoolwork, business, or personal use. First up, Apple has upgraded the iPad with the A9 chip to the iPad. This processor is Apple-developed and also inside the latest iPhones. The 64-bit A9 chip delivers performance that makes every app feel fast and fluid. Explore rich learning apps, play graphics-intensive games, or even use two apps at once. All while enjoying up to 10 hours of battery life. You also get "iOS 10" - the most advanced, intuitive, and secure mobile operating system in the world. It’s so capable, you can work and play using two apps at once, ask Siri to send a message for you, and automatically back up your files with iCloud so you can access them anywhere. And it includes new upgraded and Apple designed built-in apps that help you get more out of the latest 2017 iPad. Cameras are also newly upgraded sot that shooting photos and videos with iPad is easier than ever. You just use the built in 8-megapixel camera to shoot high resolution images or 1080p HD video. You can even correct and edit them on your new iPad with Apple's Photos, iMovie, or a different photo/video app from the App Store. The front-facing FaceTime camera works great for video calls and hot selfies and snapchats too! This new iPad is simply amazing - and will be as repairable as the former iPad Air 2, which it replaces in the Apple iPad lineup. Getting an iPad Repair will be easier than ever with this new product launch. And to make it even sweeter iPad lovers... the most powerful standard iPad ever made is being released at a low initial introduction price of just $349.99. Seriously, a wow price! So now the entire line-up of iPad Devices comes with Retina display screen. That's from the iPad mini 4, to the new iPad, to the iPad Pro in 9.7" and 12.9" jumbo design! So whether you are a school district, corporation, or individual, this newest iPad is a marvel and is destined to be as popular as ever. Just try to avoid cracking or breaking your new iPad, as iPad Screen Repair services are never fun and you don't want to be making a run to Apple or RepairZoom to fix your broken iPad screen anytime soon. iPad Screen Repair is a potentially big issue for all models of the Apple iPad. The iPad devices are made of glass screens and metal casing... they have no natural shock absorbing materials in the design or casing of the iPad. So, if you drop, crack, shatter, or otherwise damage the glass screen on the iPad Pro or iPad 2017, you have a little chore on your hands to fix that cracked iPad Screen. iPad 5 - iPad 2017 - Provides Best Repair Value in Years! 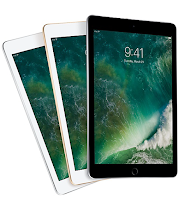 The latest iPad 2017 - iPad 5 - Best iPad Repair value in many years Apple frequently changes their iPad designs with dramatically can affect the iPad Repair industry. This is true yet again, but this time it has resulted in much lower prices for iPad Screen Repair in many years of work. The screen and LCD are now engineered and manufactured as separate parts inside the iPad, resulting in a new (similar to the old) approach for repairing the iPad family of devices. When the iPad family was introduced by Apple, it introduced a collection of issues in repair for Apple iPad owners. The large glass screens were susceptible to damage and breaking glass and resulted in the need for a whole spawned industry of iPad repairs for damaged, cracked, and broken screens. This means that there were lots of customers needing this particular repair, including schools, individuals, and organizations. Well the iPad Pro Repair industry is finally getting a few more solutions out there. This particular iPad was very slow for the independent repair industry to come along with iPad repair solutions. Most iPad Pro users were left with only the choice of going to Apple for iPad Pro Repair when they had a cracked screen or other iPad Pro damage requiring a repair. This initial situation was mostly related the the more complex design on the iPad Pro. Similar to the Apple iPad Air 2, the iPad Pro was assembled with cutting edge Apple technologies that fused together and miniaturized many parts. This made for an amazing iPad full of great new technology, such as the Apple Pencil, Stereo Sound, and crisp high resolution images from the best iPad Pro Retina Display ever invented.